Funny how the same recipe, made by the same person (yours truly) but in a different place using different ingredients, can look and taste different. 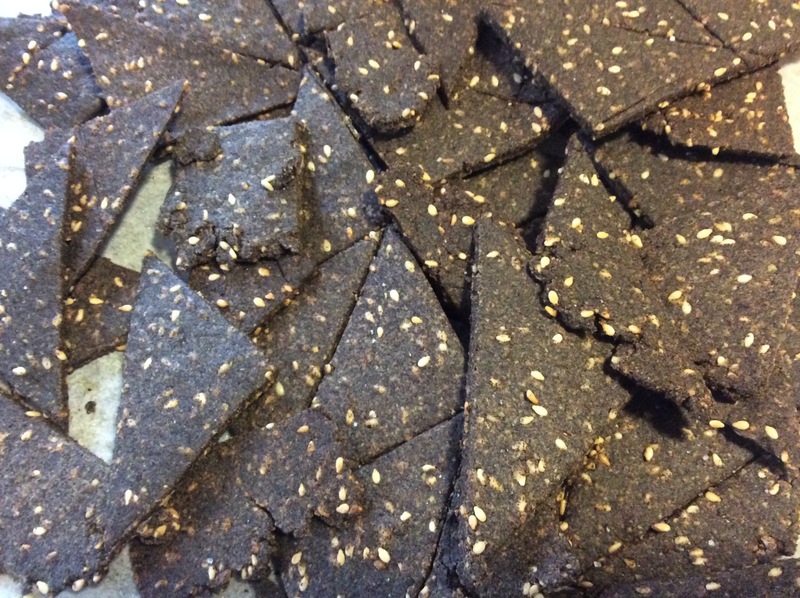 I am utterly disappointed: I don’t mind that the crackers are very dark (it was more “blackwheat” than buckwheat 🙂) but one can barely taste the cumin (Trader Joe’s) or the salt (Trader Joe’s salt crystals) in the batch I have just made for my children. I will try again with organic cumin, and more salt. If the result is better I will let you know. Hello dear neighbors, I hope life is treating you well. Do you ever have your friends or neighbors over for just an evening drink ? It is a common thing we do here in France and we call it « apéritif » (or slangishly « apéro »), meaning the drink is supposed to open your appetite… I personally think it’s just a legend : usually, by the time I am done with the drink, and especially the munchies that go with it, I don’t feel hungry any more ! On the topic of drinks and alcoholic beverages, most of them must be avoided if you have sulfite intolerance. All wines contain some, and caramel color is often added to whisky*. A little gin drowned in Perrier, maybe ? I hear it was the Queen Mum’s nightcap, and she lived to the ripe old age of 101! Anyway, these crackers come in handy, even without the drink, as a snack. They are delicious with hard cheese (provided you can have dairy) or just as it, spiced with cumin. My original version also contained sesame seeds but for those who are allergic I tried a poppy seed variation. 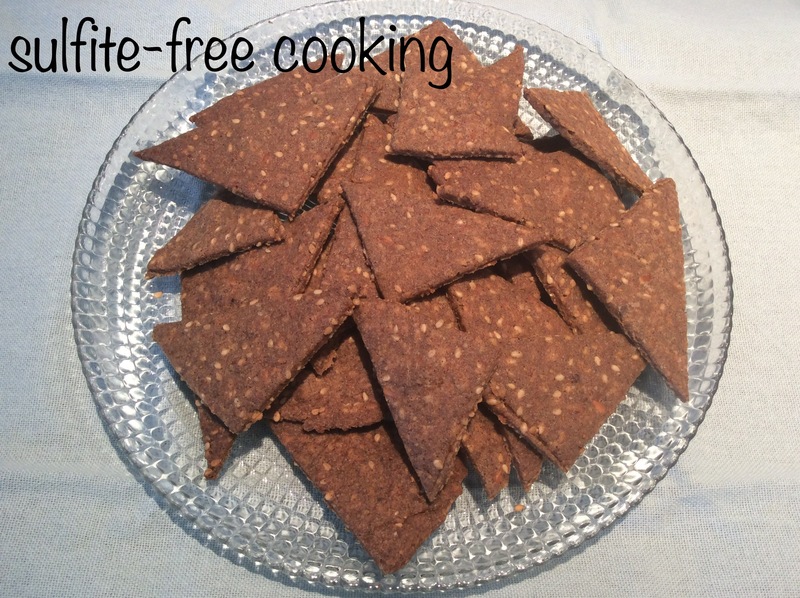 Oh, and of course they are gluten-free (I used buckwheat flour) and, unlike most of what you can find in the stores, not loaded with salt. No eggs either : flax is used as a binding agent. Tempted ? 1. Mix together ground flaxseed and water with fork and set aside. Mixture will become gluey. 2. Add salt, cumin, olive oil and mix. 3. Still with fork, add flour and sesame or poppy seeds. Finish combining ingredients forming a ball with your hands. 4. Shape dough into a rectangular block, and roll out thinly, about 2 mm, or 1/10 (one tenth) of an inch. My rectangle is about 21 cm x 32 cm, or approximately 8’’ x 13’’. Rolling should be done between baking paper and plastic wrap. Pre-cut as you like. 5. Bake between 30 and 35 minutes. 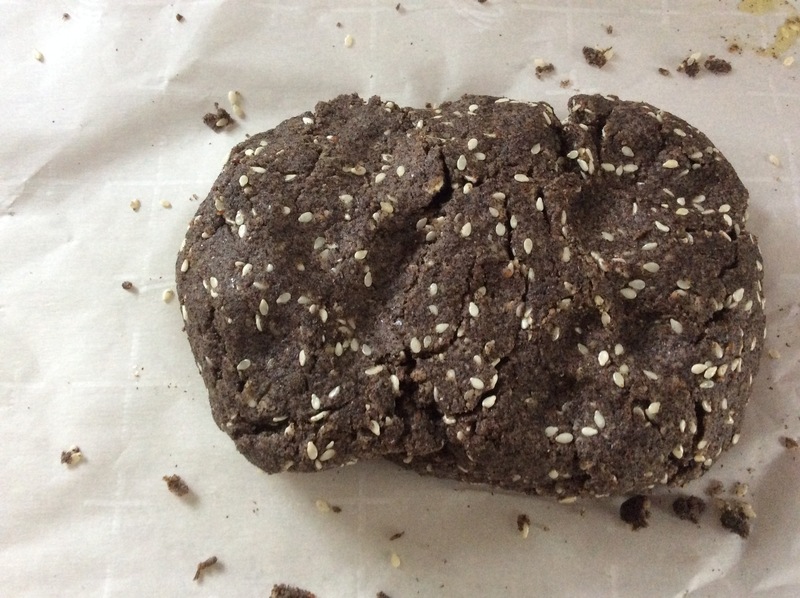 Don’t forget that buckwheat will naturally lead to a darker result than wheat. Place baked dough on a cooling rack and finally break up into individual crackers before presenting to your dear neighbors. PLEASE NOTE : These crackers keep very well several days, so there is no need to stress and prepare them at the last minute ! Any leftovers go in a jar that I keep in my car, and where I also store a few almonds. This jar is my personal survival kit for shopping expeditions !